Living in the Peak District, Richard is someone who like myself has been cycling for as long as he can remember. He used to ride 8 miles to school and back every day, and as he got into his teens he would ride 30 or 40 miles on a weekend. His son Tom started biking very young and incredibly did 36 miles aged just 5. They’ll be covering more about what Tom got up to when he was very young in the talk, which is held at Craigdon Mountain Sports on the outskirts of Edinburgh. For example, at 7 years old, Tom cycled Coast to Coast and back over 4 days and was the youngest to complete the Rapha Festive 500 (500kms between Xmas Eve and NYE). He competed in his first Strathpuffer 24 hour race aged 9 and attempted the Highland Trail 550 at 10. The Highland Trail 550 is held in May, usually over a bank holiday and is an extremely tough self supported mountain bike event, starting and finishing in Tyndrum. The route takes in a figure of 8 up towards the north of Scotland and back, covering over 550 miles. there is no entry fee, no prize money and no support. Finishing times range from 4 to 8 days. In 2014 years ago Richard rode it in perfect dry sunny conditions but unfortunately in 2016 when he returned with his son the conditions were horrendous with driving rain. They’ll be returning this year to ride the route in their own time rather than in May, when the ‘official’ event is run. This great video from Ian Barrington and Shand cycles show what I’m talking about: it really is a gruelling event through some pretty tough landscapes. I was introduced to Tom and Richard by Markus Stitz, another long-distance cyclist who has ridden the Highland Trail 550 and is a keen bikepacker. 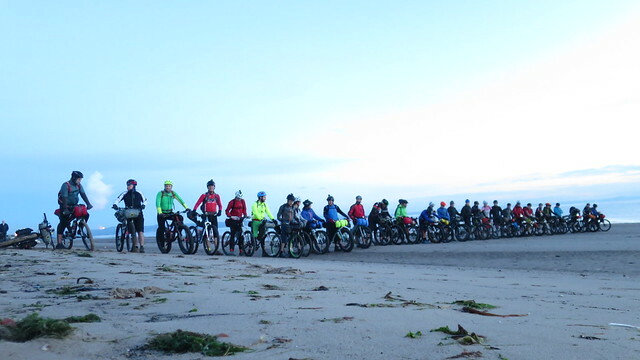 He has also founded The Capital Trail, a bikepacking event starting in Edinburgh. In 2017 it will likely be run in late September as per previous editions. The Strathpuffer is a 24 hour mountain bike race in Strathpeffer near Dingwall. Held in January, 17 hours of the event are raced in darkness. It’s one to test your endurance as well as mental resolve, not to mention the durability of your kit and the battery life of your lights! Richard has ridden the Strathpuffer since its inception 12 years ago and describes it as a challenging event – on top of the endurance the darkness and the changeable conditions are hard – he’s seen high winds, driving rain and ice. Young tom has ridden it 3 times and in January 2017, he completed 16 laps and 100 miles in the most recent edition – on his own! Finishing 33rd out of 90 male soloists. They ride for Team JMC – a social sporting and charitable team that puts enthusiasm above ability. The club started 10 years ago as a group of workmates and has developed into something much bigger. BMXers, mountain bikers, time triallists, triathletes, even marathon runners, as well as long-distance endurance riders like Richard and Tom, are involved. Like the Highland Trail 550, there’s no fee. 215 miles in a day – the furthest Tom and his dad Richard have done in a day. I asked how you Rich encouraged his lad to ride, or how he fostered his enthusiasm for it, thinking whether this might be useful for parents in Scotland with youngsters who race. But Even as I spoke I realised the question was ridiculous and knew the answer – Tom’s own enthusiasm for cycling is enough of a drive – the desire comes from within him. Rich explained that it’s usually his son pushing to go out on rides an do events. It was he who suggested they return to the Strathpuffer for 2016. You can see some of the 2016 ‘Puffer and young Tom’s passion for cycling in a film made and Directed by Dom Bush, called a Mountain Journal Short. It played at the Mountain Film Festival in Kendal in 2016 as well as the Edinburgh Mountain Film Festival and won an award at the Peebles Outdoor Film Festival. Sponsor Alpkit commissioned this as part of a series of films with interesting sportspeople and athletes. Alpkit started out making kit in small batches, focusing on good qualtity and customer service. Like many sponsorship relationships, it came about almost by accident, but the company make a custom tandem for the father-and-son duo, designed by Brant Richards primarily as an off-road machine but it is also used for road adventures. Rich and Tom’s self-supported adventure rides seems to tie in perfectly with Alpkit’s range of bags and jackets. The frame was built in 2014 and now that Tom is a bit older and stronger, they can go a lot further on it. Their most recent adventure being a unique tandem bikepacking ride, 3200km unsupported through France. This ride started in Birmingham, down to Dover and then in a diagonal line on and off road through France, before heading back up the Atlantic coast. Taking 1 month. My ears pricked up – Les Diagonales is a legendary French touring challenge that I blogged about a while back. The talk will be followed by a Q&A hosted by Markus Stitz, founder of the Capital Trail and first person to cycle the world singlespeed. Rich and Tom’s next big challenge is to ride from Tarifa in the southern tip of Spain to Nordcap – the northern most point in Europe, in Norway. 5000km in a timeframe of 6 weeks – constrained by the summer school holidays!